Growing up in China, Dr. Jean Zu had aspirations of becoming a teacher from the moment that she entered elementary school. After earning her bachelor’s and master’s degrees from Tsinghua University in China, Zu enrolled in a Ph.D. program at the University of Manitoba in Canada. In 1994, she secured a tenure-track teaching position in the Department of Mechanical and Industrial Engineering at the University of Toronto. Committed to excellence in teaching, Zu was promoted to the rank of associate professor in 1999, full professor in 2004 and department chair in 2009. All the while, she kept busy, churning out more than 300 refereed papers, including 160 journal articles, and securing millions of dollars in grants and contracts to support her budding research agenda. After eight years on the job as department chair at the University of Toronto, in 2017, Zu was named the dean of the Charles V. Schaefer, Jr. School of Engineering & Science at Stevens Institute of Technology in Hoboken, New Jersey, just across from Manhattan. Zu says that she has been preparing herself over the years for the new job. Now that she is at the helm of the school that boasts eight academic departments, 50 majors, 170 faculty and about 2,400 students, Zu says that she is intent on helping to make Stevens the go-to institution for students looking to pursue STEM careers. 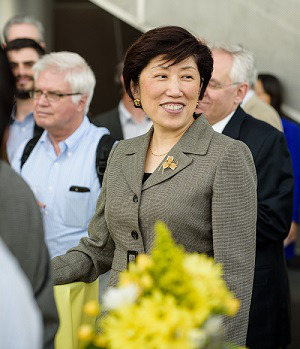 She has her sights on working to increase the number of international undergraduate students in her school and is looking to forge stronger alliances between the institution and the industry. In order to do that, Zu says that the institution has to be more proactive in recruiting and retaining more female students, in an effort to diversify its student population. Currently, women comprise about 25 percent of the School of Engineering & Science (SES). Those numbers, says Zu, are embarrassingly low. In addition, Zu says that additional work has to be done to recruit more females onto the faculty. “There’s work that we can do to increase our female faculty populations to give students role models,” says Zu, who notes that of the 23 faculty members who were hired in the last year, seven are female. She says that she is actively thinking about how to also increase minority representation. When Zu was announced the new dean last year, Dr. Christopher Pierre, the school’s provost and vice president for academic affairs, hailed the appointment as a major victory for the 148-year-old institution. Indeed, that has already started to happen under Zu’s leadership, according to some faculty and students. But Zu says that now is not the time to become complacent. More work needs to be done. This article appeared in the July 26 issue of Diverse.